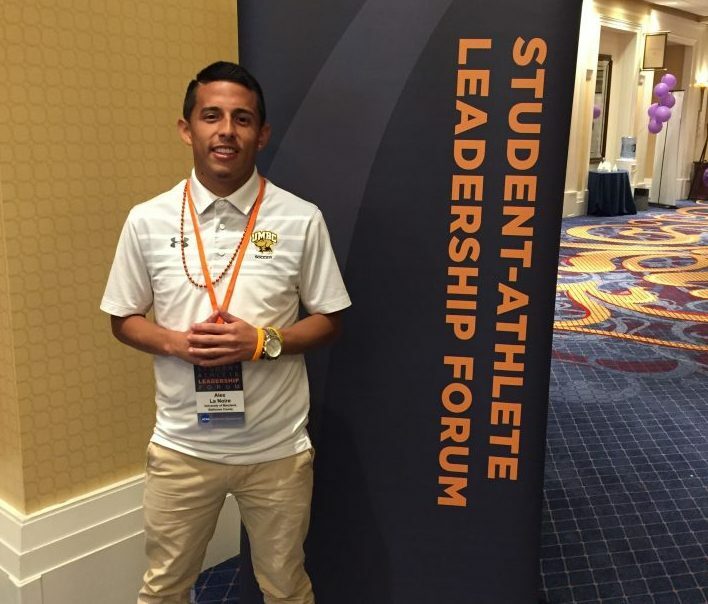 Alex La Noire ’19, financial economics, recently attended the annual NCAA Student-Athlete Leadership Forum in Washington, D.C. As a member of the soccer team and a student highly dedicated to service both to his campus and to his Latino community, the junior right-back was tapped to represent both the America East conference and UMBC in mid-November. The NCAA Student-Athlete Leadership Forum’s annual event celebrates the diverse athletes who have made an impact on their campus and who strive to better themselves and their teams. Since its inception in 1997, the Leadership Forum has given over 5,000 student-athletes the opportunity to network and grow, both professionally and personally. Alex La Noire ’19 at the NCAA Leadership Forum in Washington, D.C.
La Noire has amassed an impressive resume of both philanthropic and athletic accomplishments since arriving at UMBC. He was a recipient of the America East Helping Hands Award this past summer for his dedication to community service and commitment to academic rigor. As a walk-on member of the soccer team in his sophomore year, La Noire established himself as a campus and community leader. “At a young age, I always took it upon myself to try and bring the teams I’ve played on closer together. I learned you can still be a leader even if you don’t have the captain title,” he said. After attending the Leadership Forum, La Noire walked away with the confidence to grow his efforts as a member of the Student-Athlete Advisory Committee (SAAC), already putting plans into motion for how to implement some of the ideas sparked by the conference. “We are very proud of Alex and his role with the NCAA leadership forum. His role as a leader on our team on and off the field continues to evolve and I am excited about working with him going forward,” said Pete Caringi, men’s soccer coach. Banner image: Photo courtesy of UMBC men’s soccer team. Photo courtesy of Alex La Noire.